Troy Davis has spent over half his life in prison and could be executed for a crime he didn’t commit. According to the state of Georgia, Mr. Davis spent the evening of August 18th, 1989 participating in a string of violent acts, starting with shooting a stranger in the face, followed by pistol whipping a homeless man, and then culminating in the murder of Mark Allen MacPhail, an off-duty police officer who had helped to break up the previous altercation. The problem with this story, however, is that there is very little evidence which actually supports it. There has never been any physical evidence that linked Mr. Davis to the crime, the gun that he allegedly used has never been found, and of the nine witnesses whose testimony prosecutors used to make their case, seven have since recanted, explaining that they were threatened with legal action if they did not corroborate the police’s story. One witness, Redd Coles, has consistently maintained that he saw Davis shoot Officer MacPhail. The problem with his testimony is that multiple witnesses have since reported that Coles has admitted at various times that he shot Officer McPhail. Mr. Davis has steadfastly maintained his innocence since his arrest, and has spent the last twenty years exhausting every possible appeal, facing at least three different execution dates that were all postponed at the last moment. At the crux of his case has been the claim that prosecutors never had sufficient evidence for conviction, especially in light of the multiple recantations by key witnesses. Unfortunately, the state and federal courts have consistently refused to grant Troy a new trial, relying on legal technicalities to avoid seriously considering the exculpatory evidence that was suppressed at the time of Mr. Davis’ original trial and early appeals. The sad irony here is that the Court has justified their actions by saying that evaluating such claims would invalidate the trial jury’s original determinations, while multiple members of that jury have said that had they known then what they know now, they would never had sentenced Mr. Davis to death. Despite consistent public support from myriad figures ranging from the Pope to REM’s Michael Stipe, the legal system has consistently ignored Mr. Davis’ pleas for justice, intent instead on protecting the “integrity” of its system by refusing to take seriously those who would point out its failures. When the U.S. Supreme Court denied Mr. Davis’ final appeal this January, they not only expressed a chilling lack of concern (reaffirmed recently in their ruling in Connick v. Thompson) for potentially innocent persons accused of capital crimes, but also dealt a serious blow to the legitimacy of our justice system at large by valuing finality over accuracy. The Court’s incredibly narrow interpretation of the 1996 Antiterrorism and Effective Death Penalty Act has made it nearly impossible for those accused of capital crimes to levy claims of actual innocence because of extremely strict limits on the introduction of new evidence and a mandate to defer to the lower court’s findings. Mr. Davis is currently on death row where he awaits his fourth execution date. Despite the incredible ordeal he has suffered, he continues to fight passionately for his freedom. If we as a society value fairness, equality and justice, it is imperative that we do everything in our power to make sure Mr. Davis has his day in court. TAKE ACTION: Please take a moment to let the Georgia Board of Pardons and Paroles know that they have the authority to save an innocent man, and that they have an obligation to use it. Photo by Michael Schiffman for the San Francisco Bay View. If "they" execute Troy, they are the ones guilty of a criminal act. But they are beyond the law. So much for Human Rights. So much for Justice. So much for America, land of the free. How can the U.S. continue to criticise the lack of human rights in other countries, when they are capable of executing an innocent man? Will another black man be put to death because of the color of his skin. Do not allow the color of his skin to sway you one iota. This is tragic. Troy needs to be freed. GOD help him -- because GOD is the only one that can help overturn Troy death sentence. I will be praying for you, Troy. This is not justice, this is shameful. And on World Peace Day too. 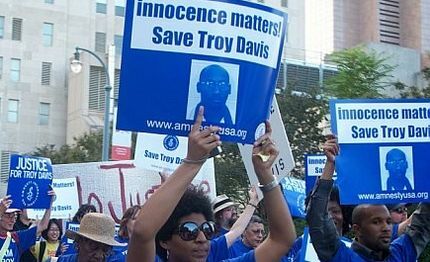 A DEATH SENTENCE MUST BE HORRIFIC FOR A GUILTY MAN, TROY DAVIS IS AN INNOCENT MAN - HE MUST BE 'TORTURED' KNOWING THIS. I have just seen the voting and I am shocked to see 3% voted yes. Are you crim's? Troy Davis should have not gone to jail in the first place. Because it was a police man that was shot any one would do, the joke is on them the one who has shot the police man is still out there. What concerns me is the number of innocent people that have been freed after first being convicted and then because of DNA, etc., the court ordered new trials. on the death penalty in Illinois because of SO MANY cases having been fabricated. Stop the death penalty in the USA!